Texas Instruments’s 0.67-inch 4K UHD chip for home theater, business and education projection displays will be available this Spring. The new chip is based on DLP Cinema technology which can be found in eight of 10 digital theatre screens worldwide. 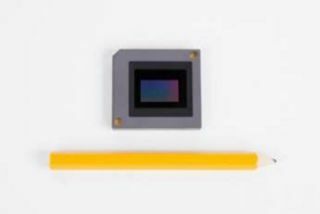 The DLP 4K UHD chipset combines the switching speed of the digital micromirror device with image processing. Texas Instruments’s 0.67-inch 4K UHD chip is not much bigger than the .65-inch 1080p chipThe latest DLP Products offering is a single-chip projector architecture that enables high resolution and brightness at a price point TI hopes will allow manufacturers to expand 4K UHD projection displays to a broader audience. The DLP 4K UHD allows for over 8 million pixels to a screen with 4 million mirrors. Each mirror is capable of switching over 9,000 times per second, creating two unique pixels on the screen during every frame for full 4K UHD resolution. • 4K UHD imager: The switching speed of the DMD enables each mirror to display two distinct and unique pixels on the screen during every frame with the hopes of reducing blur and delivering full resolution. The inherent one-chip DLP system alignment is used for color integrity of the content to be maintained without blurriness between colors. • Affordable 4K UHD: With a small, 0.67-inch DMD that is similar in size to the DLP 0.65-inch 1080p chip, customers can have access to more affordable 4K UHD solutions in settings ranging from the home theater to the boardroom to the classroom. •ANSI contrast: DLP technology’s high ANSI contrast is designed to bring out the fine details in 4K UHD content. • Image processing: DLP Products’ proprietary algorithms are designed to deliver images with crisp and clear fine lines and details. • Flexibility: The DLP chip can be used with multiple light sources including lamps, LEDs, and laser phosphor, so manufacturers can create a unique solution for various applications. “4K UHD comes to life when all of the details in the content are accurately displayed,” said Dave Duncan, DLP Products business manager, Texas Instruments. “By giving customers the ability to incorporate a 4K UHD display chip that’s roughly the same size as our 1080p chip, this new solution from TI DLP Products can be a game changer for the industry.”“TI’s versatile 4K UHD chipset gives us the capability of developing high quality 4K UHD products for a variety of applications. With this product, more people will be able to enjoy 4K UHD projection systems,” said Robert Sterzing, president, Optoma Technology.